Re-painted and smudged Hitsugaya (though it's not very neat) added a simple bg 'cause the scan is already taking up a lot of room. More resolutions available at EDD! This wallpaper looks really cool! I love it! I totally love it! <3! He looks so cool 0_0, i don't know if it's just me or he looks kinda blurry, but that's fine...i like it. This is really neat. Kudos for sticking with a simple background; I think that if you tried to do something behind him it would really detract, so I really like the plain-ness. The "cold air" (distortion/fog around the ice) seems to be a bit heavy. I'd like to see a little less blurring right past the right of his sash/vest (whatever - white scarf over black kimono - there that description should work ;) ). Other than this I think everything is lovely. Cool cool! The smudge is well done. Nice cold effect and the background fits well. Though I find the left side a little bit too black. 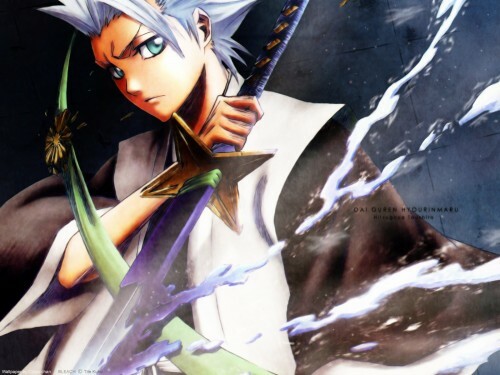 My favorite character from Bleach ^__^ He's so cool! Thanks for walling this really nice scan. I like his hairstyle.he is cool and cute,you really did a greeat wallpaper. Wow... just wow :o I haven't seen a cool bleach wallie in a while, or more like, haven't seen anything of Hitsugaya in ages .__. Aah <3 He looks so handsome x3 ! Well anyway, the simple bg + scan match(es?) each other :D scan just looks great! Another great wallie of yours! It looks really cool and matches perfectly with Toushiro-kun's personality! (He's great!). kyyaahh, the quality is so good..! love it..! I love the scan and the soft effect of the whole piece. I love the colors and the composition. And I love the perspective ^^ Great work! Keep it up! Another awesome Wallie, Love the scan you used, and the effects, and ... EVERYTHING ! keep it up !